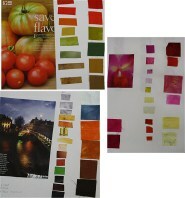 Today I taught my Modern Colour Theory workshop with the Lovely Ladies from Mountain Quilters in Peachester. We ran through lots of exercises, both with colour swatches and paints, and each particpant went home with their very own workbook complete with notes. Being such a complex subject, is was very satisfying that all ladies who attended managed to cope with the information I taught them in as simplistic approach as possible. So now they have some good tools to guide them in their future quilting ventures, be it at the fabric store or in the dye pot! That would have been a great workshop for me as I have a fear of colours....I know what I like then have to ask for help. I've done a class in the past but it mainly worked with the red "thingy" to view colours.